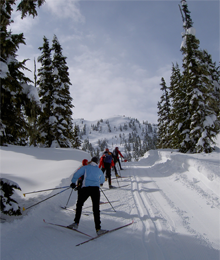 Mainline Trail (ski route only) – The most popular route to Journeyman Lodge is via Mainline, Parkway, and Upper Wild Spirit groomed ski trails. For safety reasons, snowshoers are not permitted on this route. 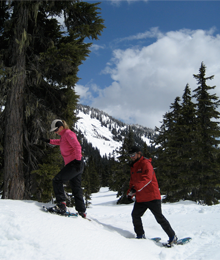 For skiers however, it features longer, but more gradual climbs and is quite open for sunshine and mountain vistas. Mainline trail is a Blue Square rated, 8.4 km intermediate trail. It begins with an initial long climb of 3.5 km that follows the original Callaghan Forest Service Road on its way up to Callaghan Lake. The first part of the trail is the toughest with moderate terrain in the middle section and even a downhill slope to Callaghan Lake. Along the way, skiers will enjoy amazing views of Metal Dome, Brandywine and Powder Mountains. 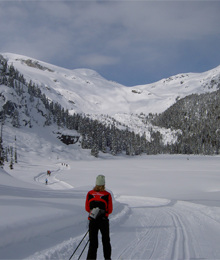 Once you reach the lake you can continue on to the lodge via the forested Parkway trail, a Green Circle rated 1.8 km ski to the final climb of Upper Wild Spirit trail (3.2km). The return trip from the Lodge following this route affords skiers a fantastic view of Black Tusk, a volcanic spire that has become one of Whistler’s most famous landmarks. Real Life Trail (snowshoe, ski, and luggage transfer service route) - As the primary service route, this is usually the first lodge access route that opens each winter season. For those opting to snowshoe in and out of the lodge, Real Life trail, to the Wild Spirit trails is the only lodge access route. It is also preferred by those heading in on touring equipment looking to shave off the extra 1.6 kms of travel. Real Life trail is accessed just off the first few hundred meters of Mainline trail. The first kilometre of real Life trail is blue rated because of a steep pitch that must be climbed before reaching the pleasant 3.5 kms of gently rolling terrain that soon turns into Wild Spirit trail. The journey up the 4.1 km of Wild Spirit trail is a classic introduction to the West Coast forest ecosystem. Majestic old growth Hemlocks and Yellow Cedars tower overhead as the trail crosses over several creeks, including the fast-flowing Callaghan Creek. Advanced and expert skiers LOVE this trail; an aggressive black diamond rating with some of North America's steepest hills. As the trail winds its way up the valley to the lodge along the Upper Wild Spirit trail (3.2km), snow-laden trees give way to sub-alpine meadows and breathtaking mountain views. Climbing skins are an excellent tool to help save energy during the long climbs into the lodge – these are available for rent at Access Callaghan. Ensure you pack sufficient hydration and a trail-side lunch/snacks for the journey *Please note, there is no running water at our base facilities but we do have vitamin water and coconut water available for purchase at Access Callaghan. Remember, you are welcome to bring an additional set of gear that can be sent up with the daily luggage transfer. 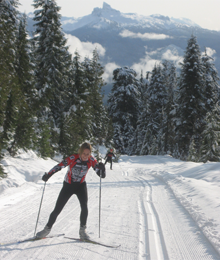 Many XC skiers will classic ski on the way in, then skate ski on the trip out. Beware of the naturally occurring Snow bombs on all ski trails. These accumulations of snow collect high up in the tree canopy and then can sometimes fall from considerable height causing bodily injury to skiers and significantly degrading trail surfaces. If you encounter this phenomena seek shelter or move to safety as the opportunity presents. Be prepared to adapt your plans – guests coming in the early winter season may be required to utilize Real Life trail route based on weather and snow conditions. Don't forget to bring your favourite beverage/refreshment to reward yourself for a job well done. Please NOTE: JOURNEYMAN LODGE does not sell alcoholic beverages but you are welcome to bring your own. Believe it or not, strong athletic types have been known to ski up in an hour and out in 30 minutes!! 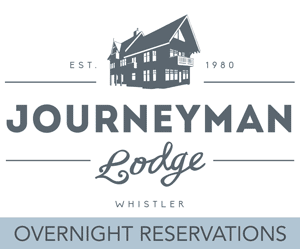 No matter which trail you take, adventuring into Journeyman Lodge is a truly rewarding experience. Pack a lunch, start early, bring your camera and make a day of it!